In 1933, there were a pair of real live World War One Flying Aces living in Kansas City, and both of them were in the writing game. Bob Burtt submitted freelance material to several outlets while Wilfred Moore worked the sports desk at the Kansas City Star and submitted occasional scripts to the paper's radio station, WDAF. The two fliers met at a party and hatched the idea for a kid's program about a young flier. The story evolved that the youngster was a telegraph operator at the Kansas City Airport named Jimmie Allen who became interested in flying. Initially broadcast on just a few mid-West stations, the Air Adventures of Jimmie Allen was soon sponsored by Skelly Oil, and kids across the country began pestering their Dads to take the family car to a Skelly Station so the kids could load up on Jimmie Allen premiums. Jimmie Allen rode the airwaves from 1933 until 1937 (reprised briefly in 1946-47) when Skelly pulled their sponsorship. Evidently, the Aviation and Radio bug still had Wilfred Moore's attention. 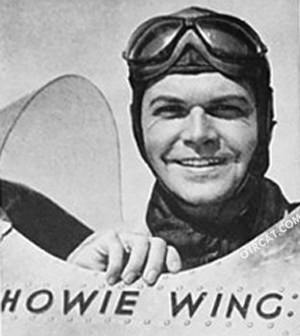 He followed up Jimmie Allen with Howie Wing, A Saga Of Aviation for the 1938 season. Skelly began to miss the “aviation and kids” show, and had the Chicago ad agency Blackett, Sample and Hummert (early home of the Hummert Radio Factory) create Captain Midnight. The Hummerts put Moore and Burtt on the project, which left Moore with no time for Howie Wing. Although Howie Wing, A Saga Of Aviation lasted only a single season, it had all the thrills and adventure of Burtt and Moore's other programs. Howie was a twenty one year old cadet pilot, hot on the trail of adventure under the tutelage of his mentor, WWI Ace Captain Harvey and abetted by his fellow pilot “Zero” Smith and Howie's girl friend, Donna Cavendish. The serial chronicles Howie winning his wings, learning the dangers of night and heavy weather flying, and even feeling the winds of War with references to German aviation. Howie Wing was sponsored by the Kellogg's Cereal Company. In addition to the popular pilots wings and buttons, one of the advertising gimmicks was an air race of sorts. Two suitcases were prepared (probably filled with Corn Flakes boxes). One was put on a West bound airliner, the other on an Eastbound. The race was to see which suitcase would go around the world and arrive back in Battle Creek first. The West bound case arrived after 25 days. The Eastbound took 29 days. Each made some 75 different stops and were handled by Eastern Airlines, American Airlines, Pan American Airway, Air France, KLM Airlines, Imperial Airways, United Airlines, Transcontinental Western Airlines, and Chicago & Southern Airlines. These materials were popular before my time and I appreciate the opportunity to hear them now that I am retired in Japan. Arigato! !